The traditional approach of using a gas water heater with a tank holding 40 to 80 gallons of water is gradually giving way to new tankless water heater in Chandler, AZ installations. Many consumers are attracted to these new tankless water heaters for many reasons. They take up less space, they conserve energy and they keep the water clear. We will expand on each of these benefits more. At 4 Fathers Home Services, we can answer all your questions, prepare an estimate as well as install your water heater for you. Call us today for an appointment. Saving Energy – instead of keeping a 40 or 80-gallon tank of water hot all of the time, the tankless water system only heats the water on demand. Consumers save a great deal of heating costs by avoiding heating water until you need it. Reduce Space Requirements – If space is at a premium then you will want to consider a tankless system. They can be mounted on a wall in your utility room leaving room for other storage requirements. Consumers in small apartments, condos and homes appreciate even a little bit of extra storage space. Keep the Water Clear – over time traditional hot water tanks build up sediment and calcium at the bottom of the tank, which does find its way into your drinking water, the sink and your tub. Older hot water tanks will pass along this sediment as they age causing your water to take on a brownish tinge. There are lots of other great reasons to consider tankless water heaters in Chandler, AZ. Instant hot water, water usage reduction, no exhaust system and more. Call 4 Fathers Home Services today to discuss installing a tankless water heater for your home, apartment or condo. 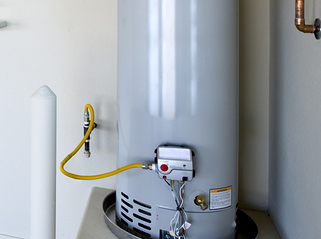 We can answer all of your questions, install a new system and remove the old water heater for you.